The Squire s Tavern was open for inspection on Saturday, October 4, 2003 and we had a good turn out. About 100 people stopped by to see the restoration progress on this 200-year-old building and exhibits pertaining to the history of the Tavern. 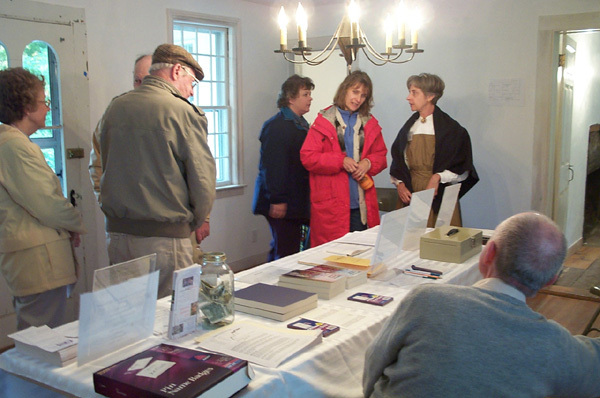 Several Historical Society volunteers were on hand to answer questions from visitors. George Hilton, co-editor of the Barkhamsted Heritage, signed copies of the Heritage book. The open house is in conjunction with the big celebration being held across the street at the main area of People s Forest: The Forestry Centennial recognizing 100 years of forestry in Connecticut. Photo above- visitors a the Squire's Tavern open house event held on October 4, 2003.